This guide was created to help you through the first stages of building up your Hearthstone collection. As Hearthstone does not allow you to reset your account, it is very important to invest the higher than normal amounts of gold you earn for creating a new account before making any irreversible decisions. This guide applies mainly to players who do not wish to initially invest their real money into Hearthstone, as it will primarily focus on how to maximize the benefits players receive from in-game quests and rewards. Though you can always spend real money on packs to accelerate the growth of your collection, you will end up spending far less money in the long run if you understand how to properly manage your in-game resources. If you came here hoping to gain a better understanding of Hearthstone's gameplay mechanics, check out our Hearthstone mechanics guide. This guide also assumes that you have completed the tutorial and are familiar with the game's basic mechanics, such as the mana system and the difference between minions and spells. After completing the tutorial you will gain access to the game's main menu, depicted below. As you can see, there are a number of menus available for you to browse. Let us take a quick look at what each one does. The Store allows you to purchase packs of cards with in-game gold or real money. The Quest Log is where you can check on the progress of your daily quests, view the levels of all your classes, and look at a few interesting statistics, including the total number of games you have won in play mode and the score of your best Arena run. The My Collection menu is where you can view your card collection, modify and create decks, and craft new cards. The Play button is where you will go to find games against human opponents. 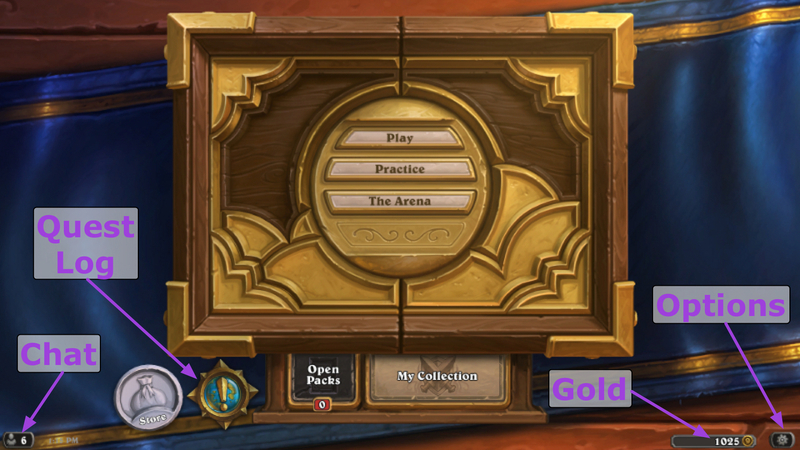 The Solo Adventures button is where you can enjoy Hearthstone's single player content, such as Dungeons Runs and The Frozen Throne adventures. This is also where you will be playing your first games against the AI to unlock all of the classes. The Arena is one of Hearthstone's two primary game modes. In the Arena, players draft new decks on the fly with cards that are outside of their collection, then battle against human opponents for increasing rewards. The Chat tab allows you to monitor the status of your Battle.net friends and challenge them to friendly duels. The Options menu is where you can modify your graphics and sound settings. Before we go into any details, we would like to offer you some advice for how to maximize the potential of your account. We place this warning at the start so that it may stand out and hopefully prevent you from misusing your precious gold and dust. After unlocking all the classes the next step is to bring all of your classes up to level 10, as you will receive free and very useful "Basic" cards for doing so. You will also be able to complete some of the quests which can only be completed once per account, such as The Duelist. After you have unlocked all nine of the classes, you will be able to start crafting cards and spending gold. However, we recommend that you hold out on spending any of your resources for the time being. Do not spend any gold. You will receive a moderate amount of gold as a reward for completing several non-repeatable quests (see below), but we strongly advise you to hold on to this gold until you have a better understanding of how to spend it. Do not disenchant or craft any cards. As a reward for the aforementioned unique quest you will receive a card pack, which will contain cards that can be disenchanted in the My Collection tab. The first time you disenchant a card you will receive 95 dust, the resource used for crafting new cards. We recommend that you do not do any of this at this stage, as it is very difficult to understand which cards are best to craft or disenchant. Do not head into the Arena. After unlocking all 9 classes you will be able to enter the Arena. Your first Arena run is free, while subsequent runs will cost you 150 gold each (or a bit of real money). We recommend that you wait on the free Arena run, and that you do not spend any gold on the Arena at this time. We recommend that you wait on spending your gold and dust until you have a better understanding of what your favorite classes and strategies will be. It is very feasible for new players to build powerful and compelling decks if they spend their resources wisely, while it will take ages to assemble a remotely competitive deck if you spread your resources between too many classes. After unlocking all the classes, you will be able to complete a number of unique (non-repeatable) quests and achievements, which will reward you with gold, dust, and packs of cards. You can always view quests in your quest log, while achievements are "hidden" until you complete them. Every day you will receive a daily quest, which will reward you with 40 to 100 gold. Completing these daily quests is the fastest way to earn gold after you have exhausted your non-repeatable quests and achievements, and earning gold is the fastest way to grow your collection. You are allowed to re-roll one quest per day, so we highly recommended that you re-roll any quests which only offer 40 gold as a reward. Do not worry if you re-roll into a quest that you are unable to complete, as you can simply re-roll that quest again tomorrow. You can find a complete list of Daily Quests, Unique Quests, and Achievements in our Rewards Guide. Level Up rewards you with a pack of cards for bringing a class to level 10. First Blood rewards you with a pack of cards for winning a game in Play mode. The Duelist rewards you with 100 gold for defeating 3 human opponents. This quest is given to you only after you complete the First Blood achievement. Crushed Them All rewards you with 100 gold for defeating all the AI heroes on Expert Difficulty. Ready to Go! rewards you with 100 gold for unlocking every class. Crafting Time rewards you with 95 Arcane Dust for disenchanting a card. As you can see, you can gather quite a bit of gold by simply playing against the AI, unlocking and leveling up classes, and playing a few games in Play mode. We encourage you to head into the "My Collection" tab and build a deck for each class, as almost any sensible deck you build will be better than the starter decks the game provides you with. Make sure to include many low-cost minions, as well as most of the class-specific cards, and you should be well on your way. We recommend that you complete Level Up, First Blood, The Duelist, and Ready to Go! straight away. This will net you two free packs of cards and 200 gold. Feel free to open up the packs as soon as you receive them, and to modify your decks to include any relevant cards you may have opened. However, as we said before, do not spend your gold on anything for now. If you have followed this guide up to now, you should be sitting on a few hundred gold (possibly more, since you may have completed one or more daily quests by this time), as well as several packs' worth of new cards. You should also have a decent grasp on the differences between the classes. At this point we advise you to choose one class to focus on. Crafting cards for only one class will allow you to build more competitively viable decks in a shorter amount of time than if you were to spread your resources thinly by crafting cards from multiple classes. The classes are balanced well enough that you should be able to win games and climb ranks with any class you choose, so do not feel as though you need to choose a class because it appears to be stronger than the others. We assure you that any class can do well in the hands of a competent player, so try to pick the class that you have the most fun with! Once you have chosen your preferred class, we recommend that you take a look at the most popular decks for that class in our "Standard Decks" section. Even if you are not interested in playing a deck which was made by another player, looking at popular deck lists should help familiarize you with the cards and strategies that are most powerful in your class of choice, which should help you make smarter crafting decisions in the immediate future. After you have selected a deck you would like to start building towards, it is time to start building it! Before you craft or disenchant anything, it is time to spend some of that hard-earned gold. There are two ways you can spend your gold in Hearthstone: buying packs of cards, and buying entry into the Arena. Each pack costs 100 gold and contains 5 cards, one of which is guaranteed to be of Rare quality or better. There are really no limitations as to what can be in a pack aside from this guarantee. You could receive two of the same card, multiple legendary cards, or several cards belonging to the same class. You could also receive a golden card, which has the same in-game function as a normal card but can be disenchanted for much more dust than non-golden cards. At this point you will likely have enough gold to purchase a handful of packs, but upon entering the store you will find that there are many different kinds of packs for you to choose from. The newest set will be listed at the top of the store while the oldest set allowed in Standard will be listed at the bottom. You are guaranteed to open up one Legendary card within your first ten packs from each set. As Legendary cards are the most valuable and can be disenchanted for large amounts of dust, the best way to quickly expand your collection is to purchase and open packs one at a time from each available set until you open your first Legendary card for each set. As you will periodically be gifted packs from both the newest set and "Classic" set as rewards for completing quests and Tavern Brawls, we recommend that you purchase packs from the second newest set first. Continue purchasing packs from the second newest set one by one until you pull your first Legendary, then repeat this process for each set which is currently available in the store. You probably will not have enough gold at this time to get more than one or two Legendaries, which means that you will need to keep track of which sets you have already opened up Legendaries from as you continue to purchase packs with the gold you have earned from play mode and daily quests. Each Legendary card can be disenchanted into 400 dust, which is enough to construct one Epic card or four Rare cards. Decks which are listed as "budget" on Icy Veins will rarely include more than four Epic cards, which means that you will more than likely be able to construct a budget-friendly competitive deck at this point. Before disenchanting any of your new Legendaries, it would be wise to quickly check if these cards are extremely popular in the current metagame. If they are, you probably want to hold on to that card instead of disenchanting it, as having to re-craft that Legendary will cost you a whopping 1600 dust in the future. Another smart way to acquire large amounts of dust is to disenchant your golden cards. When disenchanted, golden cards will provide enough dust to craft a card of the same rarity. As golden cards are functionally identical to non-golden cards, there is really no reason to hold on to any of golden cards unless you plan to include that specific golden card in one of your decks. You can easily find all of the golden cards in your collection by clicking on the "Crafting" button in the lower right hand corner of the screen, then marking the "Show Only Golden Cards" checkbox which appears. After you have acquired a Legendary card of each set, purchasing packs one at a time will no longer be the most efficient way for you to expand your collection. At this point we recommend that you try your luck in the Arena. Upon entering the Arena you will be allowed to choose from one of three random classes. You will then be tasked with building a 30 card deck from scratch, selecting cards one a time from groups of three cards in a process called the "draft". The cards that are presented to you during the draft portion of the Arena are more or less random and do not take your own card collection into account. For this reason, participants in the Arena are entering into a far more level playing field than those who choose to play on the competitive ladder. After you have finished your draft, you can being to play games with your new Arena deck. You can continue to play games with this deck until you are defeated 3 times or win 12 times. At the end of your Arena run you will be rewarded based on the number of wins your attained. You will always receive a pack from the latest set for entering the Arena (worth 100 gold), so you only need to win more than 50 gold's worth of prizes to make your Arena runs more profitable than purchasing packs. Three or four wins in the Arena should always net you that 50 gold in prizes, while seven or more wins should reward you with enough gold to immediately re-enter the Arena. Over the long run, participating in the Arena is undoubtedly the fastest way to grow your collection. It is also a ton of fun, and will familiarize you with all the cards much faster than if you played exclusively on the ladder. Before you head into the Arena for the first time, we advise you to read our introduction to the Arena. The incredible depth which is present in Hearthstone is a huge part of what makes it such a great game. Even those who have been playing since the beta are still learning new things about the game every day. With the release of Kobolds and Catacombs, there are now 1459 unique cards which can be combined into millions of potential decks. One of the first steps you will need to take as a player to is to familiarize yourself with most of the cards and potential interactions in the game. It is not sufficient to only be familiar with the cards in your main class, as you will need to have an intimate understanding of every class in the game in order to know what your opponents are capable of throwing at you. If you ever find yourself in a situation where an opponent plays a card against which you are seeing for the first time, it means that you were not fully equipped to make informed or optimal decisions that game. To help you catch up to speed on all the cards in Standard, feel free to repeatedly take our card quiz. Beyond the cards themselves, the underlying strategy of Hearthstone itself is rich and ever-evolving. Despite the obvious elements of luck present in Hearthstone, the game requires far more skill than luck to be successful. There are several high-level concepts in Hearthstone which can be easily learned, mastered, and applied to each game that will give you a tremendous advantage over players who have yet to learn these same lessons. If you are interested in learning about these fundamental concepts and climbing the ranks of the competitive ladder, we recommend that you check out our Legend in the Making series. We hope that this quick guide was able to help you get started on the right track towards having fun in this incredible game. If you read this guide too late to follow some of the information contained within (which is perfectly understandable), do not despair! Any setback you may have suffered is minor in the grand scale of things, and is which a week or two of daily quests will not be able to repair. 22 Dec. 2017: Guide revamped and updated. 30 Jul. 2014: Updated the guide to reflect the renaming of Practice to Solo Adventures, and also fixed an issue that incorrectly listed the objective of the Ready to Go! achievement. 28 Apr. 2014: Updated the section detailing crafting suggestions. 18 Dec. 2013: Further updated Arena reward mentions (specifically that you can get anywhere between 3 and 5 rewards each time).